One of the biggest blockbusters of the year is hitting home video pretty soon. Marvel Studios and Walt Disney Home Entertainment will release Avengers: Age of Ultron in both 2D and 3D Blu-ray editions on October 2, 2015. You can check out a list of bonus features and a trailer for the Blu-ray here below. It’s hard to believe that we are even getting Avengers: Age of Ultron. Seven years ago, after watching Iron Man, some of us would have laughed at the thought of getting all these heroes to work together on a film. But it has happened, not once, but now twice, and there will be four films within a few years. Geeks Of Doom was recently invited to the press conference for Avengers: Age of Ultron, where stars Robert Downey Jr., Chris Evans, Chris Hemsworth, Mark Ruffalo, Scarlett Johansson, Jeremy Renner, Elizabeth Olsen, Aaron Taylor-Johnson, Paul Bettany, and James Spader were in attendance to talk about being a part of such a massive ensemble, how the changing universe has effected their characters, and some of the stunt work that comes with a film of this size. Director Joss Whedon and producer Kevin Feige also talked about shaping the Marvel Cinematic Universe to what it is today, how some of the films in MCU’s Phase 2 changed the Age of Ultron script, and some of the challenges of shooting the sequel. Here’s 11 things you should know about Avengers: Age of Ultron, which opens in theaters on May 1, 2015. After months of releasing Avengers: Age of Ultron character posters, we are finally getting one for The Vision (Paul Bettany). Originally the character was Ultron’s creation, but in the film it seems that Tony Stark’s J.A.R.V.I.S., the AI butler in the Iron Man trilogy and The Avengers, will gain a physical form and fight alongside his fellow heroes. The poster is our best look at the character since he was only teased at the end of the latest trailer for the film. Aside from the generic toy box covers and promotional banners, this is our first official look at The Vision. Hit the jump to check out the poster. 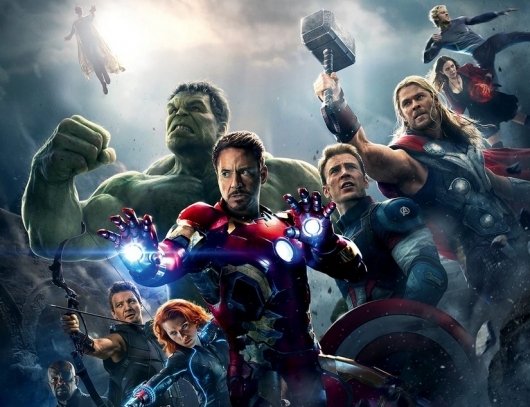 The summer blockbusters are almost here, and it all starts of with Marvel Studios’ Avengers: Age of Ultron. 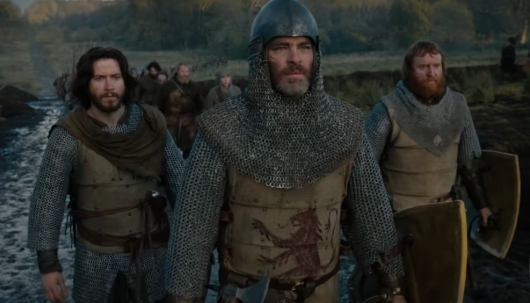 With all three trailers already released, it is now time to start seeing those TV spots appear. Disney has just released one of the first TV spots for the upcoming film. The ad acts as a headcount to remind us of all the characters that will be saving the world from the threat of Ultron. We might as well consider the spot a trailer as it runs nearly a minute long with all kinds of new footage featuring never before seen action sequences and that signature Tony Stark wit everyone knows and loves. Hit the jump to check it out. 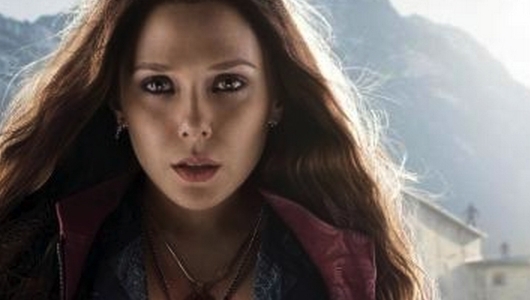 The past few weeks have seen the release of the Avengers: Age of Ultron character posters and a spiffy new trailer. We’ve seen the return of our heroes like Iron Man, Hulk, Thor, Black Widow, Nick Fury, Hawkeye, and Captain America. The posters for Scarlet Witch and QuickSilver, the film’s humans endowed with special powers, have also been released. But for those waiting for character poster for Ultron, the film’s titular villain, wait no more, because his poster has finally arrived. 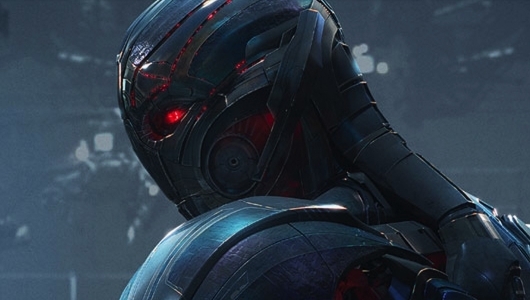 Hit the jump to check out the character poster for Ultron, as well as all the other posters that have been released. So after the Avenger’s hero character poster release campaign, came the long-awaited arrival of the third and final trailer. We’ve already seen the posters for Iron Man, Hulk, Black Widow, Thor, Nick Fury, Hawkeye, and Captain America. The timing of the release had many thinking that it would lead up to the final reveal of The Vision. But after the release of the final trailer, we had to settle for a mere tease. We probably won’t get to see him in action until the film is released, but there is still hope that he will appear in a character poster like his fellow heroes. Each of the character posters that have been released are just that, character posters. At first it looked as though these posters were pieces of a larger set due to the shared background, but now we know that is not true. However, now that more character posters are being released, and the first two posters to be revealed since the trailer dropped are for Scarlet Witch and QuickSilver. Hit the jump to check out them both out as well as the ones that have already been released. During the releases of the Avengers: Age of Ultron character posters, Robert Downey Jr. announced that there would be a big surprise coming our way on March 5. ABC confirmed that they would premiere the world exclusive new trailer for the sequel Thursday during the debut of American Crime. When it comes to these trailer reveals, some things don’t go according to plan, but that’s a good thing for us because Marvel has just released the third trailer for Avengers: Age of Ultron. The trailer really doesn’t hold anything back as there is so much more action than we have seen in any of the previous trailers and clips. And we kind of get our first look at a close up of The Vision. Hit the jump to check it out.